Let’s be honest. Dating’s hard. Between nerves and expectations, we can often forget how to be engaging and likable. Melissa Wadsworth, author of HOW TO MAKE SMALL TALK shares the dos and don’ts of dating. Remember to always trust your instincts and have fun finding Mr. or Ms. Right! The most straightforward goal of a date is to be engaging and likable. The other person wouldn’t have agreed to the date if he or she wasn’t hoping to have an enjoyable time. Be joyously confident or nervously confident. We each have something to offer by way of our company. Know that some of your essence will be glimpsed. Enjoy the process. There is nothing to fear because on a date you take one step (an opening question perhaps) and observe what happens, and then you decide on the next step. Learn from the experience. As long as you take away something from the date, you’re progressing. Try to reveal a bit of yourself. A little mystery is good on a date, but you don’t want your date struggling to figure you out either. Take a break when you need to. This is what bathrooms are for. A few minutes can give you time to ponder your progress or to regroup. Have positive expectations that a date will go well. Be open to the fact that a date, and a relationship, can play out in many different ways. To keep interaction moving along, much like traffic, knowing what not to do can often be as helpful as knowing the right things to do. Don’t always be “on.” To cover nerves, it is sometimes tempting to talk nonstop or to try out all our “best” lines and attention-getting tactics one after the other. After a while it feels awkward to go “natural,” and your date may be exhausted trying to intuit your authentic character. Don’t try too hard. This includes being unnaturally polite, making sure there are absolutely no silences, laughing too often, using profane language, and being too intense or serious. If you find yourself doing these things, take a breath and relax. Think of something you’d really like to know about the person or to comment on an observation you’ve made during the pause. Don’t lie to impress your date. You don’t want to have to cover your tracks later because you said you had a better job position than you do, more important responsibilities, a higher salary, a famous friend/acquaintance, or the perfect family. Don’t keep your date waiting. No matter how wonderful you look by taking all that extra time to get ready, it’s not polite to keep a date waiting or worrying whether he got the right time or place. Don’t over compliment. Everyone enjoys a sincere compliment: “You have a lovely smile,” “You have beautiful eyes,” “What a great laugh.” If your date starts to squirm or looks uneasy, you’ve gone overboard with the compliments or gotten too personal. Don’t jump to conclusions or make immediate judgments. A date is a time of exploration. Make sure that you are leaving yourself open to really hearing, and are allowing your date to speak for him- or herself. Don’t forecast failure. Practice feeling confident—that you have unique insights, information, life experiences, personal qualities, viewpoints, and emotional energy to share. Trust your instincts. If you feel particularly “right” about someone, go with it. On the other hand, if your instincts are screaming “run!” walk calmly to the nearest exit. Nailed the first date? Become fluent in the kissing language. Learn how to improve your basic conversation skills and engage in pleasant small talk for more positive face-to-face interactions in this simple, visually engaging guide.With today’s focus on technology and digital communication, face-to-face small talk is becoming increasingly difficult. How do you start a conversation with a stranger? What do you need to do to make a great first impression? What should you do when the conversation starts to drift off? 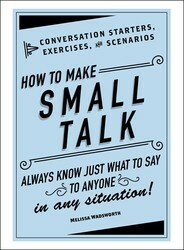 In How to Make Small Talk, you’ll learn the art of small talk for all types of situations. With simple advice, engaging visuals, and brief exercises, this book makes it easy to improve your casual chitchat skills. From professional networking to first dates to casual run-ins with a neighbor, you’ll always be able to strike up a great conversation and leave a positive, lasting impression.